Ugly bottom banners and annoying interstitial pop-ups that interrupt gameplay: this is what most people think of in relation to mobile advertising. Yet free-to-play developers are constantly looking for monetization methods that don’t annoy users but can drive consistent revenue. Born out of this challenge comes a unique method of ad monetization: in-game sponsorships. In-game sponsorships are the integration of a particular brand or IP into the core functionality of a game, making it feel like a completely natural part of the user experience. This is opposed to conventional network advertising, which pauses gameplay or takes up part of the screen to deliver an ad to the user. In sponsored games and apps, the theory is that there is a win-win relationship between the advertiser and publisher: the advertiser wins with increased engagement with the brand since users are more likely to interact with the brand when it’s a part of the game itself rather than just another ad to dismiss. And the publisher wins due to not having to sacrifice retention for ad revenue because of users’ negative experiences. Recently, two mobile gaming publishers have chosen to monetize via in-game sponsorship deals. 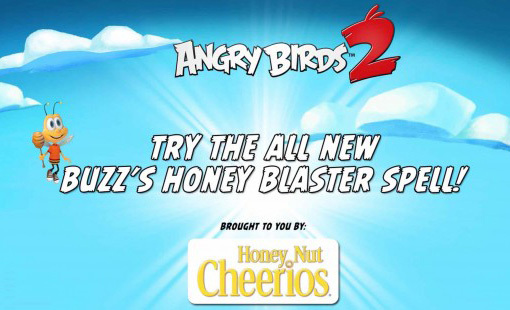 First, in Angry Birds 2, users were able to use a new spell in the form of Honey Nut Cheerios to defeat the pigs. The feature was introduced via the well-known Honey Nut Cheerios “Spokesbee,” and for a period of two weeks, a persistent button existed on the HUD to urge users to purchase more of the spell. The limited timed nature of the sale may have caused users to interact with the Honey Nut brand more frequently, and at the start of the promotion, all daily active users were guided through using the spell at least once. The potential reach of the campaign may have been millions of users – many of whom are thought to be potential cereal purchasers. While the results of the partnership may or may not have been a good investment for the advertiser, the campaign was indeed a model integration into Angry Birds 2 as it utilized the core-loop of the game and provided a powerful tool that users would want to interact with. Another example of brand integrations into a mobile game is Zynga’s FarmVille: Harvest Swap. Recently, the developer introduced a product called Sponsored Play, which presumably makes sponsored levels and other brand integrations into Harvest Swap an easier proposition. 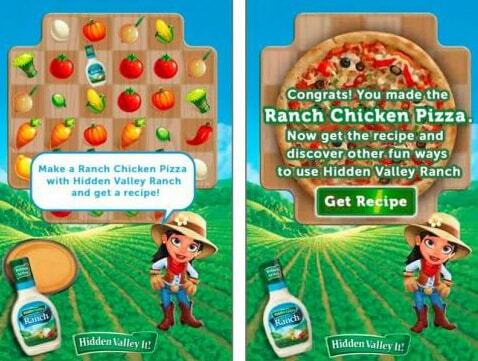 To demonstrate this integration potential, Zynga partnered with Hidden Valley Ranch dressing to create a sponsored level where the user can make Chicken Bacon Ranch Pizza. In order to pass the next level, users had to interact with the Hidden Valley Ranch product, observing the logo and brand messaging, and learn about a recipe they could make with the dressing. This is a great example of brand integration because it is well known that FarmVille users are predominantly females, in the age range of 25–55. This demographic is largely the population that makes shopping decisions in the home, and users may be more likely to make Chicken Bacon Ranch Pizza for their families after playing Farmville: Harvest Swap. Zynga is no stranger to sponsored ads – the original FarmVille game had many partners, including one with American Express to promote the release the AMEX Serve product in exchange for Farm Bucks from the users. Additionally, both Rovio and Zynga show advancement in the technology behind sponsored integrations – the integration is delivered server side – which allows for easier and more frequent sponsored integrations since it requires less engineering time to set for each campaign. To be able to run sponsored integrations as a revenue source, there are a few requirements for game developers and publishers to meet. First, the game needs to have a wide enough audience. The examples above are games that have many millions of installed users – which is no small feat for the average studio to accomplish. A counter-example, however, would be if the core demographic is highly engaged in a particular niche – such as fans of a sport or stay-at-home moms. Second, there must be a natural game mechanic for the company to sponsor – users would be annoyed if the integration didn’t easily fit into the core loop of the game. In addition to that, advertisers would be interested in a placement that is not only natural but also highly surfaced – they will pay the big bucks but only if all daily active users see it, and preferably more than once a day. Last, the user base must match the demographic of a particular product – you won’t see Goodyear integrating into Minion Rush – kids won’t likely be purchasing car tires any time soon! For studios that are starting out designing their game, it may make sense to start these potential business development conversations early on. Seeking out partnerships can take time, but if a game can demonstrate value, the advertisers will come. Sponsored integrations are a win-win relationship for the businesses involved, but also for the user. One of the biggest complaints about free-to-play games is how aggressive the monetization is. However, sponsored integrations are a solution to that. Games can have a revenue stream that doesn’t interfere with natural gameplay and that can provide interesting content alongside the ad. However, this type of advertising is limited only to the biggest players. That being said, though, the more mobile gaming becomes a part of everyone’s’ daily life, the more likely that new and innovative revenue channels will open up.